One of my friends was coming to pick me up the other night so we could attend a meeting. I decided that I would start walking down the road to meet her. I was walking down my driveway just taking in all the green and beauty around us this summer, causually waving to the neighbor and rather enjoying the pleasant evening when all of a sudden I heard the unmistakeable buzz. I stepped dead in my tracks and looked down. About 4 feet in front of me slithering across the road was a huge rattlesnake. I spun and headed back to my house for a shovel. In the meantime I look up to see my neighbor coming down the road. I know he likes the dumb things so I wave him over. He gets out of his truck, grabs a shovel and proceeds to roll the shovel handle up the snakes back. He pins its head down and then reaches with his bare hands and picks the thing up with his young son and myself watching on. I about fainted. I just back from vacation! We saw all but 2 temples in Utah, 3 in Idaho, 1 in Billings MT, and 1 in Nevada. We went to Yellowstone, Mount Rushmore, Cheyenne Frontier Days, we also saw Miranda Lambert and Dierks Bentley in concert. We saw a lot of beautiful country and had an absolute blast! Kelly rolling down the hill at Manti. My study crew...we finally made it!!!! The graduation support crew!!! Cowbelles and all! I called mom...her response...don't call your dad he wouldn't be much help and for that matter neither am I! What a lot of help she was! :) It is trapped in my 5 ft by 2 ft light fixture. I am sad to say that it is going to have to leave this world in this very light fixture. Pictures from my Oklahoma trip. I really enjoyed spending some quality time with a wonderful family! It made for an awesome spring break! Days like today make life worth living. Dad called after church and said he and mom were going on a drive and asked if I wanted to go along. I told him to come pick me up. He lost one of his oldest and dearest friends this week and was having a hard time. He felt a drive would help. We drove towards Heber and then turned back towards Snowflake. When we turned towards Claysprings dad started telling stories. He talked about deer hunting, hauling hay, and just the places around that area. 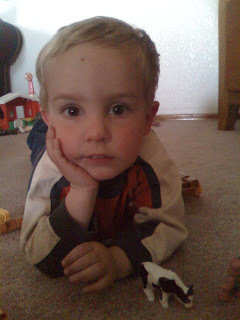 We went to visit Jefer and Jamie but did not overstay our visit. Dad is not one to wear out his welcome. We decided to take the Burton Road back across. He told of the time that Uncle Rog had roped a deer and tied it to a tree and how they got out of that predicament. He then talked about his job herding turkey's. His mom looked out and he was eating his lunch at 8:00. We had a good laugh. We then stopped at the Carlisle residence and visited for a spell. It was a good day for reminiscing. Dad pointed out many of the places he lived. I treasure these times I get to spend with him. He is such a good man and I love him for the wonderful person he is. Kallee wanted to have a party at my house the other night so she invited her friends and we had a "Farmopoly" party. We just got in the truck when Kamron came out carrying Diesel. He wanted to come and we were not leaving withut him. 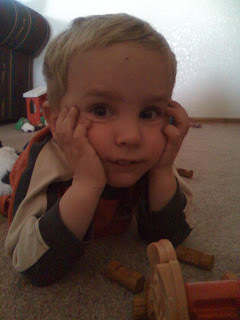 When we got to my house he pulled out the Lincoln Logs. I got down on the floor to play with him. He had me building and he was watching. It was too cute to pass up a photo opportunity. I sure love this little guy. I love life! What more can I say? I am a single outgoing gal that looks to get the most out of each moment I am given. It has not been an easy road arriving at this point but I can honestly say that life is for the living and I am trying to live it to the fullest! I have many wonderful people in my life and I am thankful to those who have rallied behind me and have helped me to become who I am today. I have a strong knowledge that Heavenly Father loves me and wants me to be the best I can be.